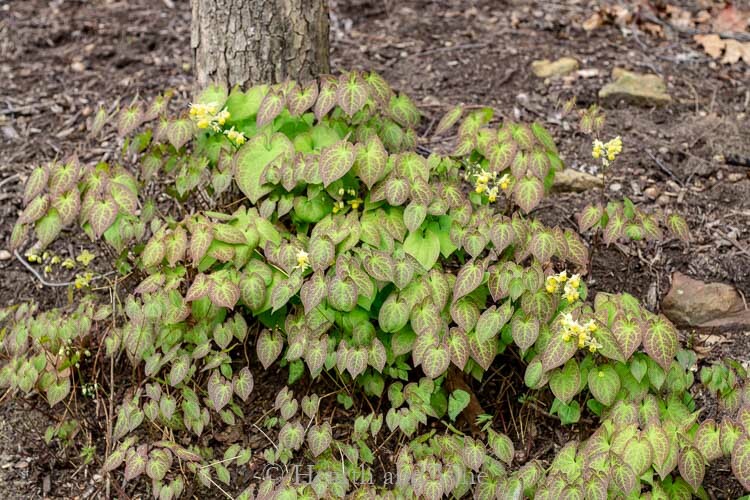 Learn about 11 different perennial shade plants that look great even if they are not in flower due to their interesting foliage. 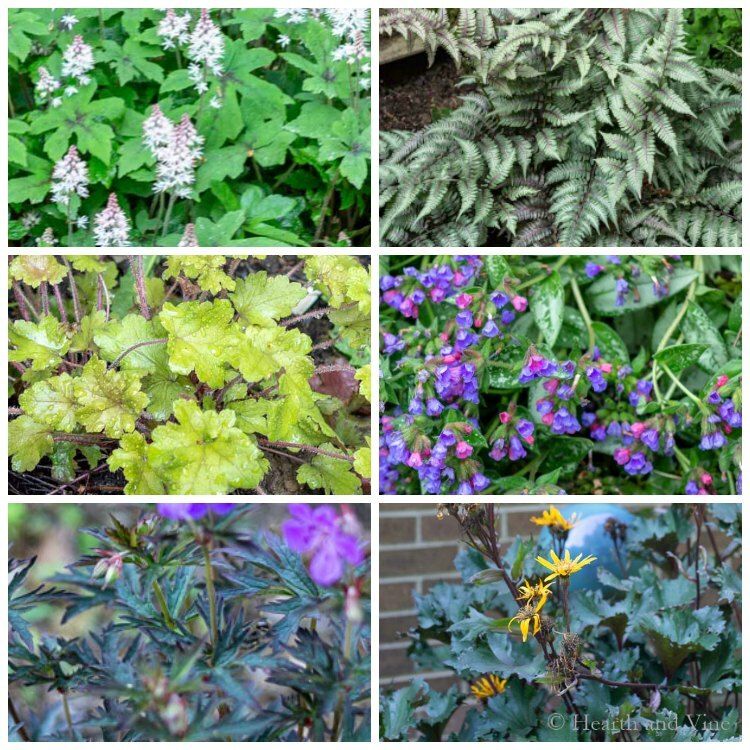 If you are a flower lover but your yard is full of shade then consider some of the many beautiful perennial plants with colorful foliage. Shade loving plants don’t have to be boring and some of them even flower. Typically, the flowers are not significant. One of the first signs of spring with pretty little yellow flowers. This pretty perennial grows well under our dogwood tree and turns a beautiful shade of red in the fall. I love this bright green color and the nice way it keeps its mounding shape. There are many, many different varieties of this perennial with really interesting leaf colors from very dark, almost black, and some with interesting striping worth consideration. This guy is often found in nurseries with the annuals even though it is a great perennial for the shade. Both the leaves and flowers are worthy and I almost always use it in my pots because of its wonderful trailing shape. A good one for a very shady spot. Pretty delicate flowers in the spring. I love the compact form and leaf shape. This shade lover also comes in varieties with deep red centers like Tiarella ‘Jade Peacock’ or Tiarella ‘Fingerpaint’. 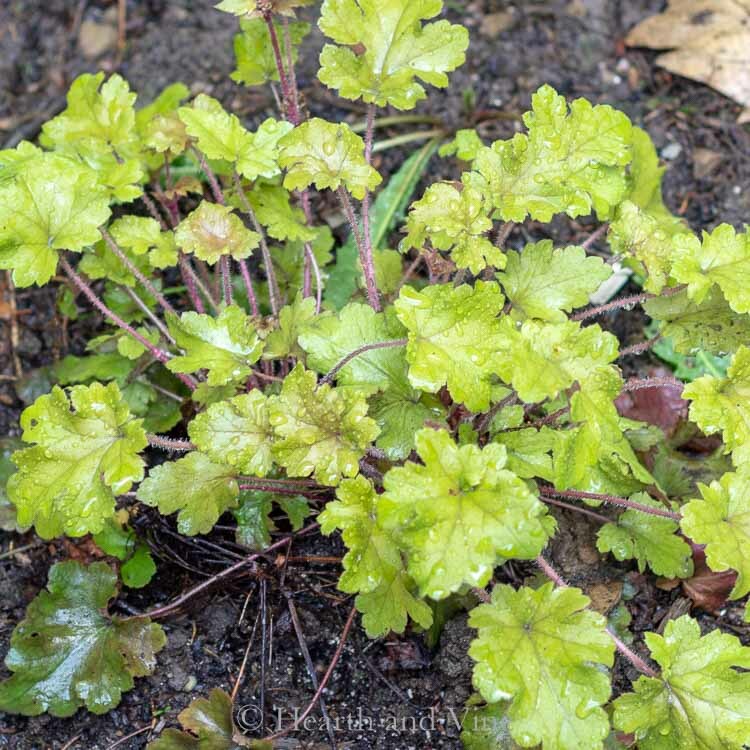 This hardy begonia grows well in the shade and self-seeds for more plants each year. The pretty pink flowers appear late in the season when most of the flowering plants are done. However, I love the heart shaped leaves with their dark red veins that are around all season long. 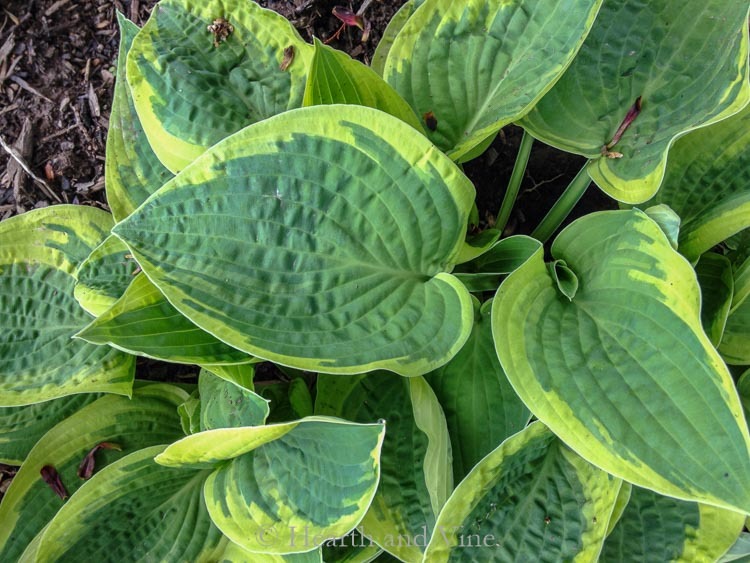 A pretty hosta which of course is a great shade loving perennial. I love the blue color. It’s easy to grow in the shade and you can divide it for more to plant elsewhere or give to a friend. I like to divide them when they are just starting to show in the spring. 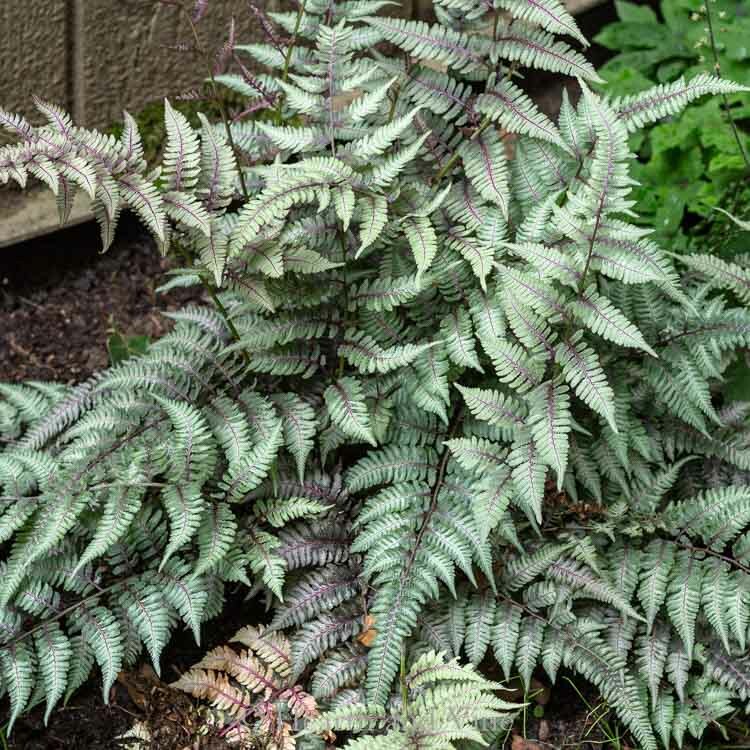 Japanese painted ferns do not flower but they are so pretty and grow great under trees or other shady spots in the garden. Ligularia is a great choice for shade if you want something a little taller. The shape and color add great texture and you are also rewarded with pretty yellow flowers late in the season. 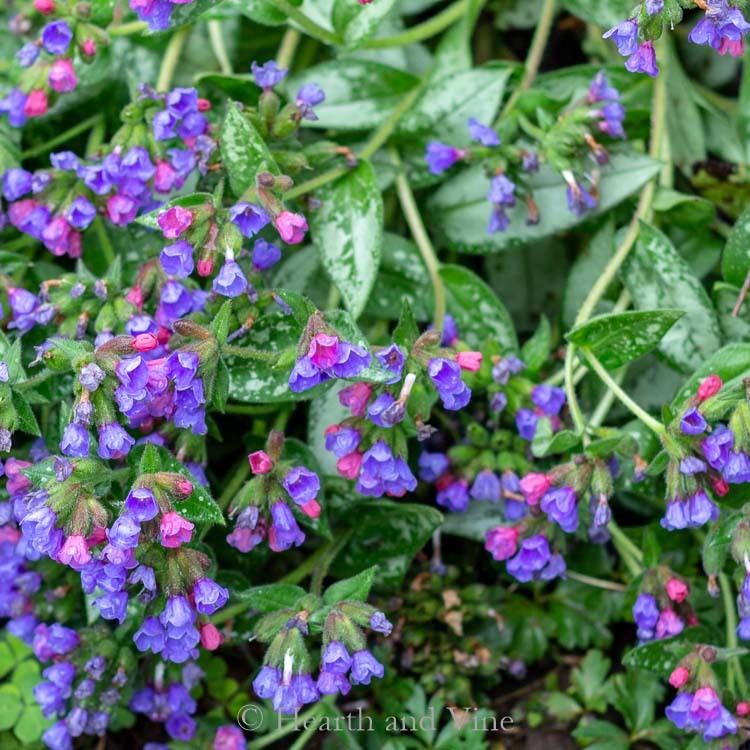 Lungwort flowers are so pretty in the spring. However, they also have interesting foliage for you to enjoy in your shade garden all season long. Not to be confused with your grandmother’s geraniums, this hardy geranium is a perennial. I have so many of these Cranesbill perennials, which seem to grow well in many different conditions. This one called Okey Dokey also has beautiful foliage so you can enjoy it even when it’s not in flower. Last but not least is Solomon’s Seal. I do adore the sweet blooms but the arching stems and general architecture of this plant is gorgeous in the garden. Easy to grow in the shade, even under trees. I hope you will consider using some of these perennials for their pretty foliage in shady parts of your garden. Most of them do have pretty flowers at some point, but their colorful foliage offers interest during the entire season. P.S. You may also like my post on Favorite Shade Loving Plants for a Container or my post about Deer Resistant Plants. See these and many others on the Gardening Page. Thank you for such a comprehensive list of shade plants. I like that they aren’t just for warm weather climates. I hope that I might find some of these at my local nursery’s. I hope you find what you are looking for Shirley. Usually, a nursery will carry plants that will work in your area. There’s always the online option. 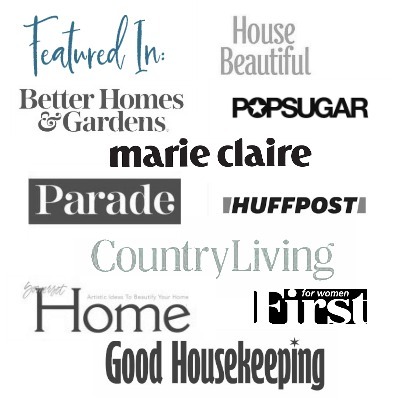 Great list, Patti, thank you. You are so welcome Sheila. Patti, I love hostas but I seem to have a rabbit that also likes them. Any pointers for keeping them safe and healthy from the rabbits. Thanks for sharing all your info. Love it and it is helping me get my yard together. Paula, rabbits, and deer both love hosta. The only tip I have is using something like Liquid Fence. But, you have to apply it every time it rains which can be a hassle. However, I found this to work for us when we were planning a big spring party. I just went out every few days and sprayed or after a rainstorm. It kept the rabbits and deer away for that time period. If rabbits are the only problem you could consider tall containers, raised beds or fencing. Thank you Patti for such a quick reply. I will definitely look for this and give it a try. Well I did not Hostas could grow in the shade. All strains of hostas? Because my favorites are hostas and chicks and hens and what we call wood roses. Just found out my husband was reuped in Syria and was done in August last year. I guess I can stop waiting for the knock on the door. Says May now. I asked if this was Trump pulling them out he said yes. But the house with the great yard will probably get sold before he gets here. Your info has helped me so very much. Whatever property we get I can put everything I learned to use. Jody, hostas are perfect for shade. I believe the blue varieties (my favorite) do best in shade and some of the lighter ones prefer a bit more sun. Still, if they are getting a few hours of sun in the morning they all should thrive. Prayers for your husband’s safe return. Definitely take some of your plants with you to your new home.